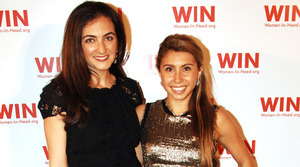 (NEW YORK) Rent The Runway continues its ascent: Since its birth in 2009, founders Jennifer Hyman and Jennifer Fleiss have seen their designer dress rental business skyrocket. Now with over 25,000 dresses and accessories and 165 designers to choose from, the duo of Harvard Business School grads are looking to expand. Thanks to a third round of financing that came in at $24.4 million from previous investors and new ones like American Express, Novel TMT, and Advance Publications Inc. (parent company to Condé Nast and Fairchild Publications), they can do just that. What’s in their well-financed, fashionable future? An expanded number of showrooms, for starters. Currently the company has one retail-esque location, tucked in their West Village HQ in New York, where women can shop for their one-time wares in person and consult with a stylist. Beyond top-notch customer service outlets, the company plans to expand its operations with either a bigger warehouse or multiple warehouses around the country in order to ship more product and tailor more in-house operations programs for internal flow. And while the company is already a mega marketing tool for designer brands, they plan to build upon the marketing component of the brand, although how, exactly, remains to be seen. Also on the RTR forecast: The company is expanding categories beyond their current offering of apparel, jewelry, and bags. We’re crossing our fingers for shoes, and, if so, a note to Hyman and Fleiss: we’ll take those square-ish toed boots we spied on Calvin’s runway, s’il vous plaît!